The Amazing Colouring Book for Awesome Girls is welcome addition to the raft of kids’ activity books. The premise of the book is simple – 20 b&w pictures for colouring, of girls & women doing a range of activities and roles not traditionally associated with girls. Is there a place for a feminist colouring book for girls? I would answer a big yes – the marketplace unfortunately remains saturated with “girls’ colouring books” dominated by lazy stereotypes of princesses, flowers and pretty dresses. A feminist colouring book for girls? 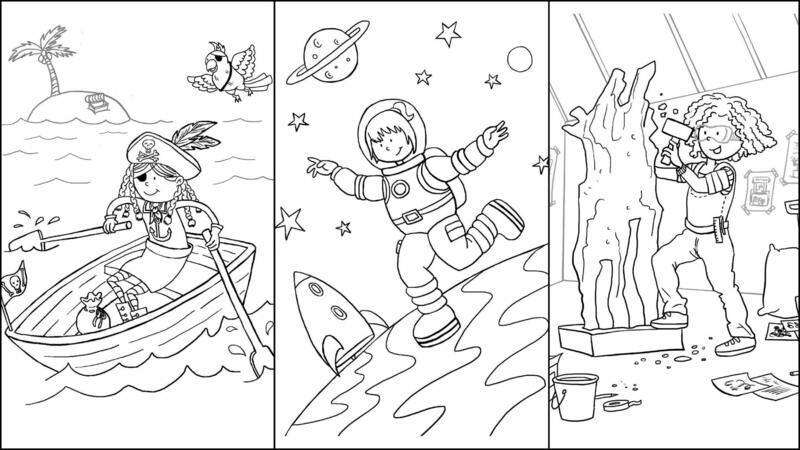 Just 3 of the inspirational illustrations to colour in – a girl being a pirate, astronaut, and sculptor. The simple line drawings make this just right for younger children – a great way to introduce young minds to images of women in roles ranging from knight to palaeontologist. The book is a great conversation starter – my 4-year-old daughter was asking me about all the different things the women were doing. Some, such as Astronaut and pirate were obvious to her, but the likes of sculptor or chemist less so and gave us a chance to talk about them. The image of a female artist – splashing paint on her canvas – even lead to a discussion about Jackson Pollack (just to reiterate, my daughter is 4). Another nice detail is that each picture is on a separate page, so no need to worry about colours bleeding through to an image on the other side. Some may object to it being called The Amazing Colouring Book FOR Awesome Girls, phrasing which excludes boys. I get that point, and have some sympathy with it. However, I also think that while more people are becoming aligned with the gender neutral ideal when it comes to shopping for kids, there are still those who will only buy things for girls that are labelled as such. These are the people that still need to be reached, and a book like this can do that. I feel any misgivings about the wording of the title are completely overshadowed by the empowering nature of this project. The book is by Rachel Garlick, a London based illustrator who’s also worked as a storyboard artist on high-profile films & tv shows such as Peaky Blinders, Call the Midwife, Broadchurch, 24, and Galavant. Hopefully, she’ll continue to create content for children too – perhaps we’ll see a similarly subversive colouring book for boys from her next? In the meantime, I’m glad my daughter gets to use The Amazing Colouring Book for Awesome Girls. The Amazing Colouring Book for Awesome Girls has an RRP of £4.99 ($7.49 in US). We were sent a copy free of charge for the purposes of this review. My little lady loves colouring, I must remember to add this to the list for xmas.